Join us on September 28th for the fourth annual Energy & Water Nexus Summit, the region’s leading forum on the the vital intersection of energy and water resources. This year’s Summit will examine the effects and economic implications of energy and water issues on our state, including hot topics such as the drought, desalination, and the Bay Delta Water Conveyance Plan. The latest economic projections estimate that the drought will have a $2.7 billion impact on California’s economy, including substantial effects to the state’s employment levels, agricultural production, and water availability. Overcoming the challenges caused by the drought and planning for future changes in California’s water supply will require innovative solutions to secure sustainable energy and water resources for our region and state. This year’s Energy & Water Nexus Summit will feature industry leading subject matter experts, and will provide an engaging forum to examine and discuss the developments, challenges, innovations, and the pivotal relationship between energy and water in Northern California. 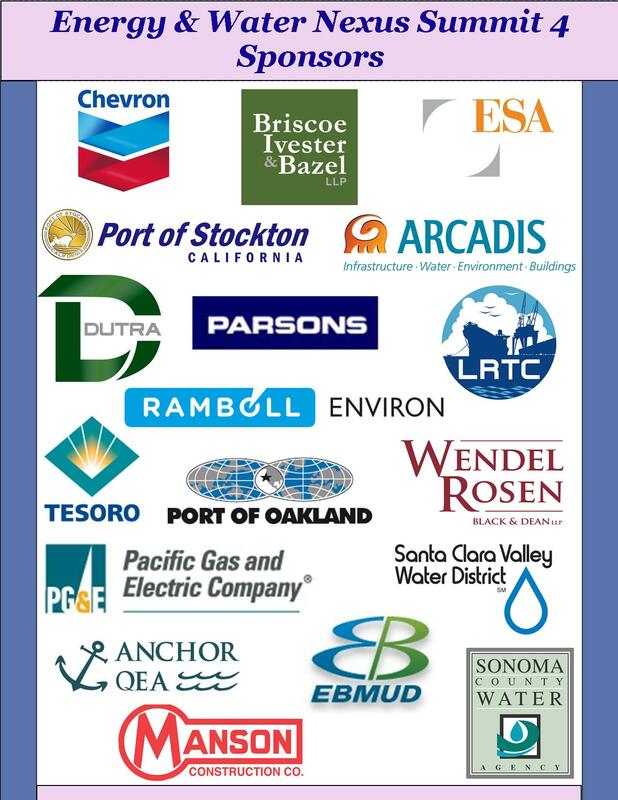 Thank You to our Sponsors of the Energy & Water Nexus Summit 4!